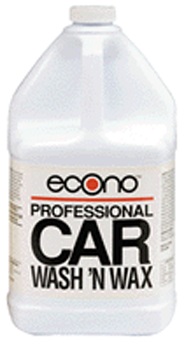 Echo Wash ’n Wax is a blend of highly concentrated Finger Lakes Spotless™ Car Wash and Castle® Seal Spray Wax. 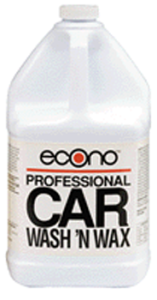 The combination creates mounds of suds to help loosen and clean dirt and grease. In addition, Seal Spray Wax creates a sheeting action to allow a complete spotless rinse, leaving a protective wax-like finish. The formula will not harm wax or painted surfaces. 1. Vehicle surface should be cool and out of the sun. 2. Dilute 4-5 ounces of Wash ’n Wax into 4 gallons of water. 3. Activate suds with strong stream of water (approx. 4 gallons). 4. Wash one section at a time with suds, starting at top. 5. Hose off thoroughly after each section. 6. Wipe dry with chamois. 7. Replace water in bucket as needed.